Have lots of PDF documents that are protected by a long and complex passwords on computer, feel inconvenient and boring to type them each time before opening a PDF file? Why not try to remove password from PDF? 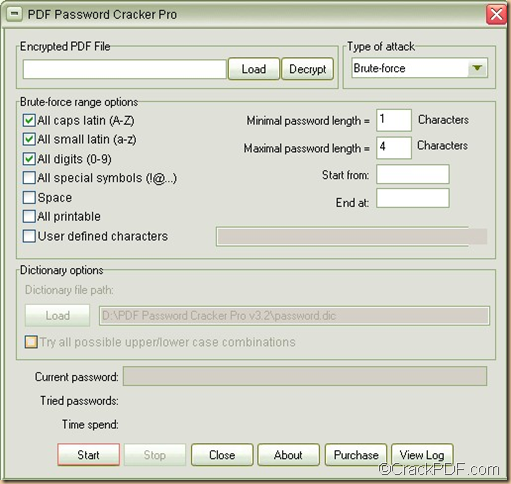 There’s a professional PDF password cracker called PDF Password Cracker Professional that can help you professionally remove passwords from PDF files without other changes to the PDF document. 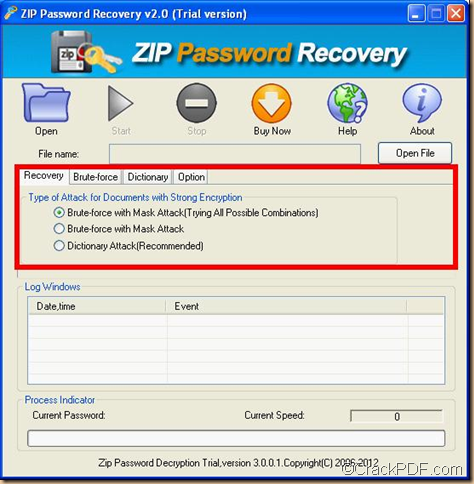 It also enables you to recover user passwords with brute-force and dictionary attacks. What’s more, it supports key search attack that allows you to decrypt PDF files with 40-bit encryption in a reasonable time regardless of the password length and complexity. 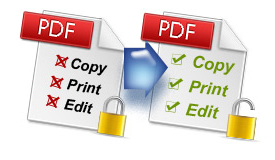 There are two different PDF passwords provided by the standard security-owner password and user password.Owner password protects the PDF documents from printing, editing, copying,etc. User password locks the file to prevent the PDF files from opening or viewing. 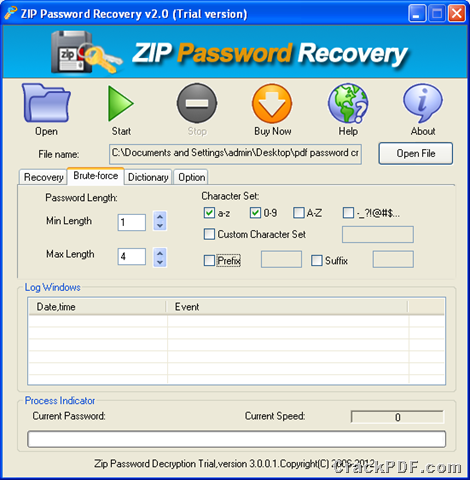 PDF Password Cracker Professional can decrypt PDF documents with only owner password instantly. The decrypted PDF documents could be opened by any PDF viewer with editing, copying, printing and annotating functions enabled. Firstly, it is compatible with a lot of operating systems such as Windows 98, ME, NT, 2000, XP, 2003, and Vista. Secondly, it supports PDF 1.7 (Acrobat 8.x) files (with 40-bit RC4 decryption, 128-bit RC4 decryption, or AES decryption), compressed files and unencrypted meta data. Thirdly, it supports abundant decryption modes: Adobe Standard 40-bit decryption, Adobe Advanced 128-bit decryption and AES decryption. 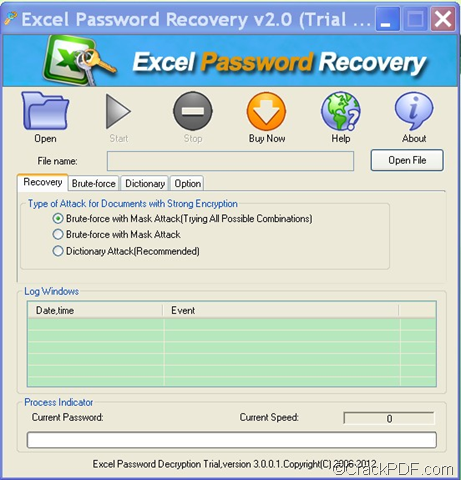 Lastly, it recovers user password with brute-force or dictionary attacks. 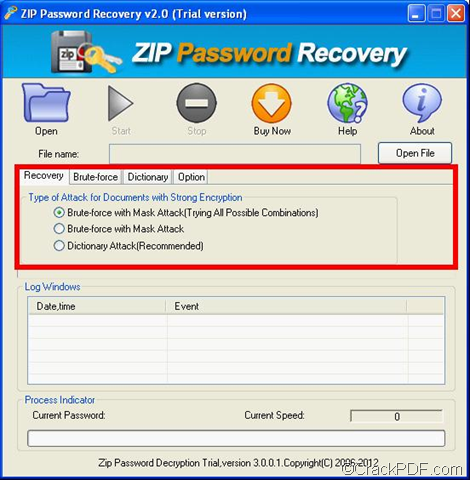 How to use PDF Password Cracker Professional to remove password from PDF? 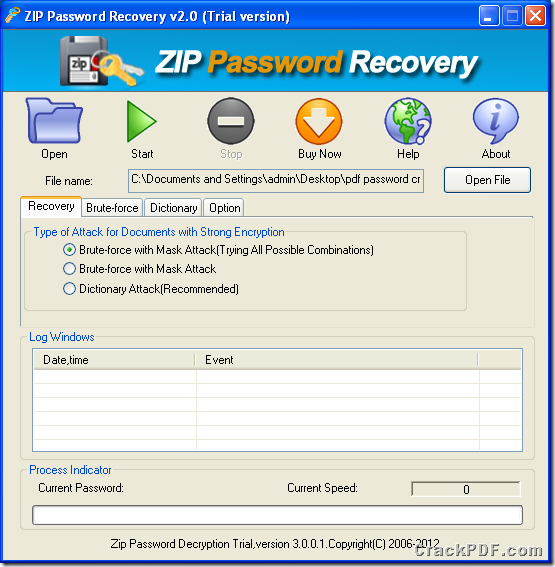 Firstly, download and install PDF Password Cracker Professional. Then, load encrypted PDF files. Finally,save the decrypted PDF files. Just with a few minutes, PDF Password Cracker Professional can help you easily remove password from PDF and unlock the secured PDF files. Now try to free download to experience this amazing software by yourself now! For more details, please contact:support@crackpdf.com. How many times have you been asked for a password when opening a PDF file?And how many times have you received a dreaded PDF not printing message when sending a PDF file to the printer? To deal with the above problems, you need PDF Password Cracker to remove the restriction from protected PDF documents. In our daily life and work, we may often receive password protected PDF documents such as mobile bills, bank statements, other financial reports, etc. And, sometimes it is highly inconvenient to remember or type the complex and long passwords. PDF Password Cracker is a professional and powerful PDF decryption tool that allows you to remove passwords from encrypted PDF files with high quality and speed. It also enables you to crack the PDF password that protects the PDF from editing, copying and printing. If you know the right password, it also enables you to crack the open password easily and efficiently. 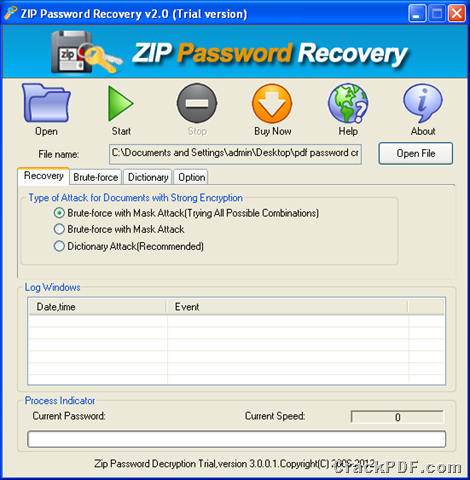 PDF Password Cracker can be used to decrypt user-password protected and owner-password protected PDF files. Then you may wonder what user password and owner password are. User Password, also named open password, is used to encrypt the PDF and prevent them from opening to protect the owner’s right. Generally speaking, utility bills, bank and financial documents are encrypted with user password. Only if you enter the correct “user password”can you open the documents. 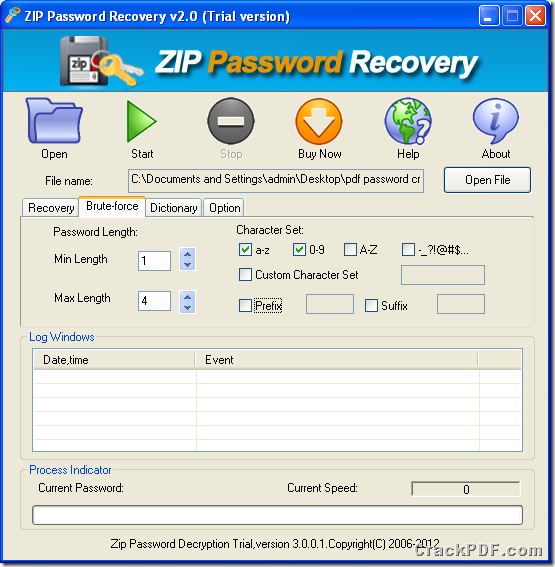 Owner Password, also called master password, is used to protect the PDF documents from editing, changing, printing, copying text and graphics into the Clipboard, adding annotations and form fields, etc. 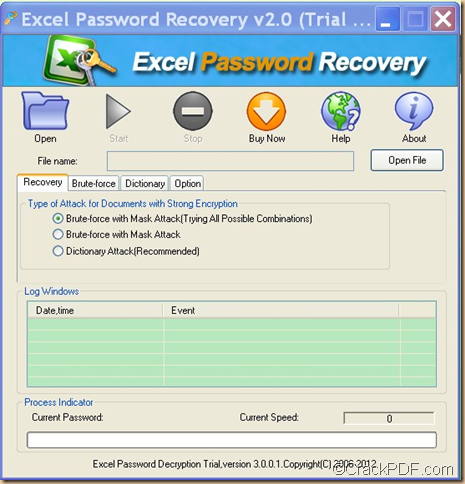 With this password remover tool, you can remove passwords from encrypted PDF just in 2 steps. Firstly, import the encrypted PDF files. Secondly, export the decrypted PDF files.Then, you can feel free to view, edit, copy, and print the full-version PDF files. Of course, the above steps is just a simplified description.For details, please visit its homepage. Any questions, suggestions and problems about PDF Password Cracker, please do not hesitate let us know. We will reply you ASSP. PCX (Personal Computer eXchange) is a device-independent raster image file format developed by the ZSoft Corporation of Marietta, Georgia, USA. Although it’s supported by most optical scanners, fax applications, and desktop publishing systems, it not supported by web browsers. Then how to transfer and share PCX images via web pages? A good solution is to convert them to PDF files is a good option. PDF (Portable Document Format) is a widely accepted document format for document sharing, which can be compressed easily and platform-independent. In this article, I would like to share a professional and easy-to-use PCX to PDF converter with you. 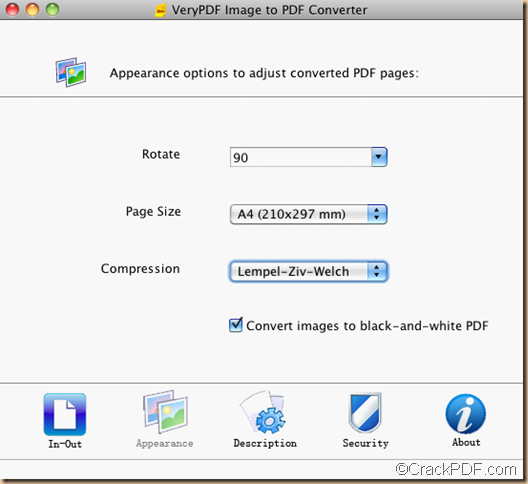 Image to PDF Converter for Mac allows you to batch change images such as JPG, JPEG, BMP, PNG, GIF, PBM, PCX, PPM, and TIFF on Mac OS X to PDF. With user-friendly interface, you will never find an easier way than it to convert PCX images to PDF. What’s more, it also allows you to edit the properties of PDF flexibly. 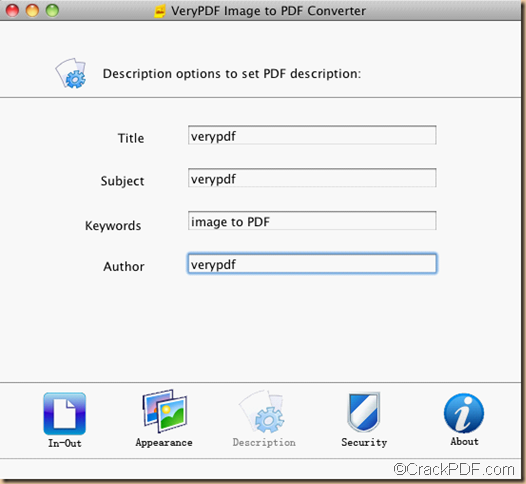 With the help of Image to PDF Converter for Mac, everything will become so easy. Below is a tutorial on how to convert PCX images to PDF on Mac OS X. Firstly, you needed to download Image to PDF Converter for Mac and install it. Click Open, then select image files in dialog box of Choose files to convert , and then click Open to add the PCX images to the panel. clicking Description and encrypt PDF with passwords by clicking Security. Click Output folder to choose an output folder for the output PDF files, and then click Convert to start the conversion. That’s it! Then you can share the PDF documents as you like. Easy, right? Free download it and experience yourself now! If you want to know more how to convert PCX to PDF on Mac OS X, please leave your comments below or contact us via support@crackpdf.com. If your company use e-faxing, you may need to convert pdf to tiff. What will you do? TIFF (Tagged Image File Format, also called TIF) is an image format file for high-quality graphics, which is also the standard scanned image file format. It is a popular format for high-color-depth images among graphic artists and publishing industry. TIFF images are difficult to alter and can be viewed by anyone, which is a common format for faxing and is often used in document imaging, document archiving and e-Discovery software. TIFF is highly compatible with image editors, Photoshop, GIMP, Paint Shop Pro, QuarkXPress, Adobe InDesign, etc. So, in many case we may have to convert PDF to TIFF images to protect our PDF documents from unwanted copying or changing. 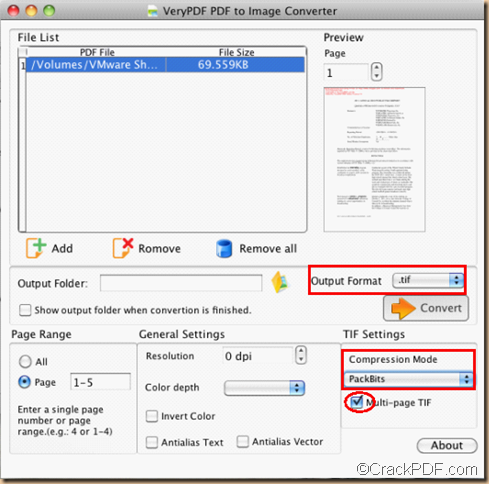 1.Drag and drop PDF files to the converter’s interface to add a batch of PDF files at a time. 2. Choose TIF from the output format list. As the PDF converter is a 6-in-1-out PDF converter, we need to check up the box and drop down the list to choose TIF. Note: If you like, you can check “Invert Color” to invert color for TIF(TIFF) image, choose different compression modes for TIFF image in “Compression Mode” spin box of “TIF Settings” group box and create multi-page TIF file by checking “Multi-page TIF” option. 3. 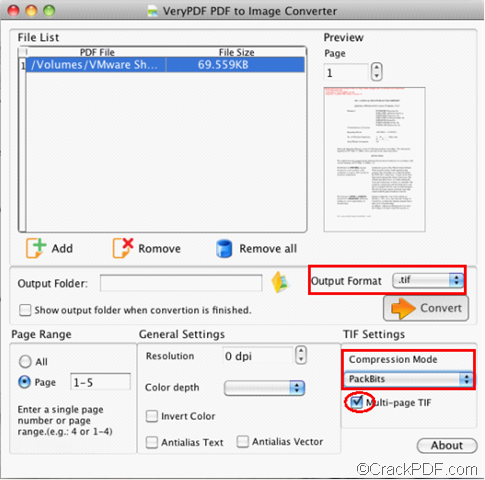 Choose output folder and click Convert to convert pdf to tiff. The conversion will be finished in a few seconds, So easy to convert PDF to TIFF, isn’t it? 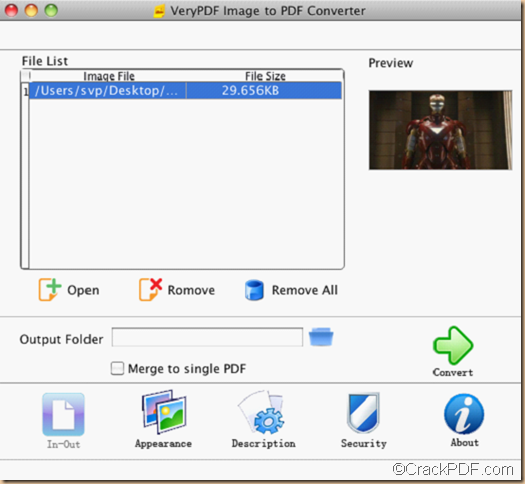 Come to free try PDF to Image Converter for Mac by yourself. By the way, this PDF to Image Converter for Mac can also convert PDF to JPG, PNG, GIF, TGA and PPM with perfect output quality at fast conversion speed. To know more about how to convert pdf to tiff (tif) , you can contact support@crackpdf.com. Searching for way to convert bmp to pdf on Mac OS X? You can find an answer from this article. BMP, more commonly know as bitmap files, is a standard image file which was used by OS computers. But it’s not as popular as PDF (Portable Document File) which can be displayed exactly the same on different systems. So sometimes you might need to convert the BMP images to PDF documents for viewing on different systems. To help you convert bmp to pdf on Mac easily, here we would like to introduce Image to PDF Converter for Mac to you. With the help of Image to PDF Converter for Mac, you can create PDF from many kinds of images such as BMP, JPG, JPEG, PNG, GIF, PBM, PCX, PPM, and TIFF on Mac OS X singly or in batches. Due to its user-friendly GUI interface and fast conversion speed, you will never find an easier way than it on converting BMP images to PDF documents. Besides, you can also edit properties of PDF files flexibly. The tutorial below will tell you how to convert BMP to PDF with it step by step. Preparation: Free download Image to PDF Converter for Mac and install and run it on your computer to get ready. Drag & drop the source BMP images or click Open > select image files in dialog box of Choose files to convert > click Open to add them to the panel. a.Click Appearance to rotate PDF, set page size and edit compression mode of images for the output PDF. b.Click Description to edit PDF descriptions such as title, subject, keywords, and author. c.Click Security to encrypt PDF with passwords. Click Output folder to choose a destination folder for the output PDF files, and then click Convert to change BMP to PDF. Is that simple and easy? 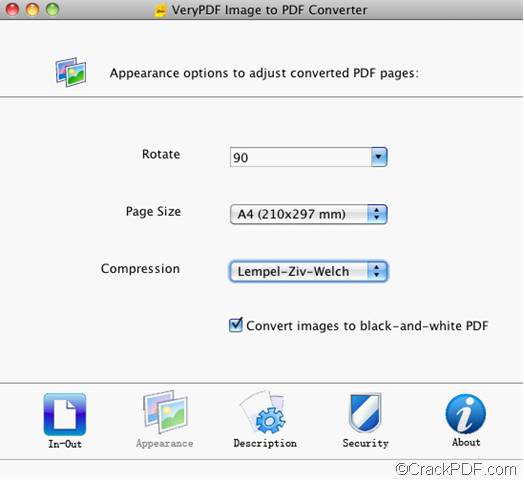 Why not get Image to PDF Converter for Mac and try to convert bmp to pdf right now! If you have any problem about this application, please bring up your problems to support@crackpdf.com or post your comments below.